ADT Project Consulting GmbH (ADT) has been entrusted by GFA Consulting Group GmbH, representative of the Federal Ministry of Food and Agriculture (BMEL), to implement the “Sino-German Cooperation Project on Animal Breeding and Husbandry in China”, Phase II. 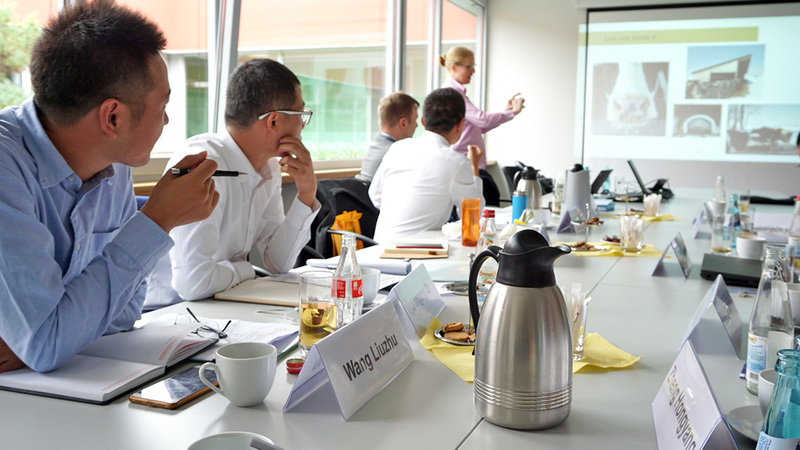 As part of the project, ADT is conducting the “Sino-German Capacity Building Programme for Young Professionals of the Agricultural Sector in 2018” which is implemented in close cooperating with DLG International GmbH and the Chinese partner organization CICOS (The Center of International Cooperation Service). This Capacity Building Programme aims to stimulate the professional exchange between young specialists from both countries and to strengthen German-Chinese networks in the long term. In the framework of the programme, from 12th of September to 20th of November 2018, 7 Chinese Young Professionals are staying in Germany at German hosting companies, which are all related to the livestock industry and visiting accompanying seminars. Hereby, the Chinese Young Professionals shall gain theoretical knowledge as well as practical experiences in relevant German production technologies and management methods. Furthermore, two study tours will be arranged for German and Chinese Young Professionals in Germany and China, focusing on animal breeding and husbandry systems for dairy, beef and pork production. Therefore, 10 German Young Professionals will travel to China from 14th – 25th October 2018 while 5 Chinese Young Professionals will visit Germany from 7th – 20th November 2018. Both groups will travel through different regions and follow a varied program of research and private sector organizations to get to know more about the livestock sector in each other’s country. As Kick-Off Event for the group of the 7 Chinese Young Professionals which are currently passing three months in different German hosting companies, ADT Project Consulting GmbH and DLG International held a five days seminar from 12th – 16th September 2018. During a three-day workshop at the DLG Test Center in Gross-Umstadt, the Chinese Young Professionals did not only get an overview on Animal Breeding and Husbandry in Germany but also on German cultural and organizational issues to be prepared for their daily activities during their stay in the hosting companies. Further, the group had the opportunity to visit the DLG Test Center facilities and could thus see the unique testing area of DLG for agricultural machineries and equipment. After the workshop the group went on a one-day excursion to visit a dairy as well as a pig farm in the Southern region of Hesse. They jointly enjoyed the Rhine Valley during a boat trip from Eltville to Rüdesheim before traveling on 17th September to their designated hosting companies which are located in different regions of Germany. The Chinese Young Professionals will complete their stay with a visit of the international fair “EuroTier 2018” in Hannover on 15th of November before they will go to exchange their experiences and impressions gained at the hosting companies in a final closing seminar taking take place in Frankfurt am Main from 17th -19th of November 2018.